Banish split ends with the Hairfinity Split End Mender Kit. Gentle Cleanse Shampoo and Balanced Moisture Conditioner keep your hair soft and healthy from root to tip, while Revitalizing Leave-In Conditioner gives your hair added nourishment and improves split ends up to 92%. Gentle Cleanse Shampoo (12 oz) - Gently cleanse, refresh and remove product buildup with this sulfate-free, hydrating shampoo. Formulated with our exclusive CAPILSANA® COMPLEX, it won’t strip hair of its natural moisture. Proven to strengthen and reduce up to 82% of breakage. Revitalizing Leave-In Conditioner (8 oz) - This light, fast-absorbing leave-in spray nourishes and moisturizes each strand with an infusion of vitamins and minerals. 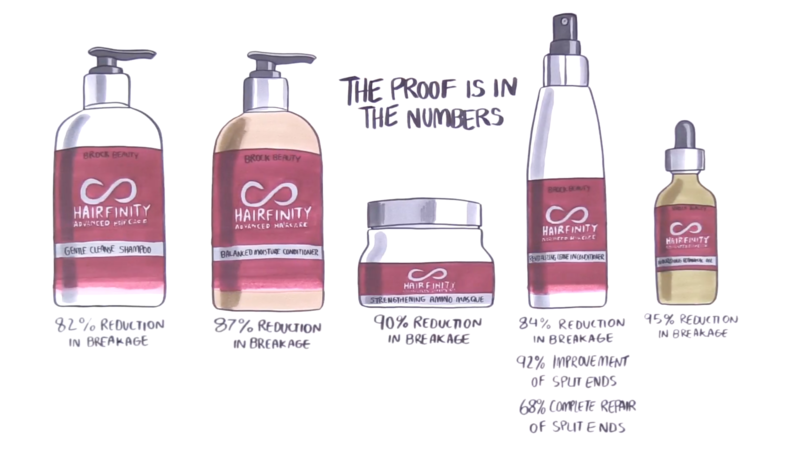 Reduce up to 84% of breakage and 92% of split ends; completely repair up to 68% of split ends.